Wishing on a star is ancient. Certainly more ancient than Disney could ever hope for. And of course wishing on a star happens in Japan also. From Sakura Hostel Asakusa, in 2012. 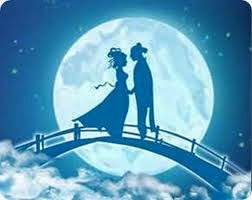 Tanabata ( JP: 七夕 ) , also known as the Star Festival or the Festival of Sevens, was a festival borrowed from Chinese culture around the 8th century CE, and dedicated to two stars: the Weaver Star and the Cowherd Star. The Weaver was a princess of the heavenly king, who wove beautiful clothes by the bank of the Milky Way. However, she despaired at meeting anyone, because she was so lonely. The heavenly king realized her loneliness, and arranged her to meet the Cowherd, whose job it was to keep the celestial animals from wreaking havoc. The story goes, these two truly fell in love in the celestial court; the heavenly king, who had set it up in the first place, was pleased and agreed to the marriage, as long as the two did their work keeping everything in order. But so lost in love were they, that soon their duties were neglected. As punishment, the king decreed that the two should separate, and placed the Milky Way between them: however, even he could not quench love completely, and so allowed them a chance. If their work was done, and the sky was clear, the Weaver and the Cowherd could see each other once a year around midsummer, crossing the Milky Way to spend time with each other once more. Tanabata is supposed to be that day: the seventh day of the seventh month. The first time the couple met each other like this, though, they found the Milky Way still separated them and there was no way to cross. Despairing, the Weaver collapsed into tears; moved by her tears, a flock of magpies came and offered to create a bridge, using themselves and their wings to do so. The Weaver thanked them and the lovers could meet again. However, it's said that if it rains on Tanabata, the magpies will not notice the Weaver's need, and not come to create the bridge. In that case, the lovers have to wait another year before they can meet. It's a time of wishes and of love; the wishes made do not necessarily have to be romantic in nature. After all, this festival also celebrates determination and steadfast loyalty. So, any wish is okay. People sometimes write their wishes on paper streamers and hang them up, or display them, or (at the least) go to a shrine to write their wish. If the streamers are being hung up at a home or a school, the streamers are usually hung on branches of bamboo. Sometimes, instead of bamboo, it's sakaki (a sort of evergreen, often used in Shinto ceremonies), but of course, different places sometimes have their own variations! 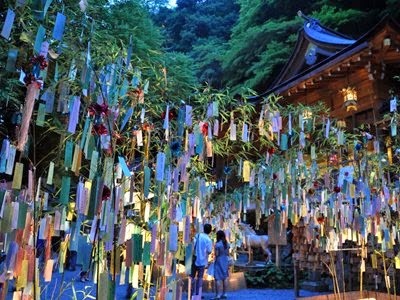 For example, because this festival originally used the lunar calendar (seventh month of the lunar calendar, that is), some places in Japan still celebrate Tanabata using the lunar calendar, even though Japan has switched to the Gregorian lunisolar calendar reckoning. For example, Sendai area holds the Tanabata festival this year from August 6-8. 7 kinds of paper decorations are made, ranging from paper cranes wishing for long life, to streamers for financial success, luck on exams, or even ornate decorations meant to emulate fishing nets. Some cities decorate their shopping districts and shrines will be busy also. So what would you wish for, if you could wish upon a star?